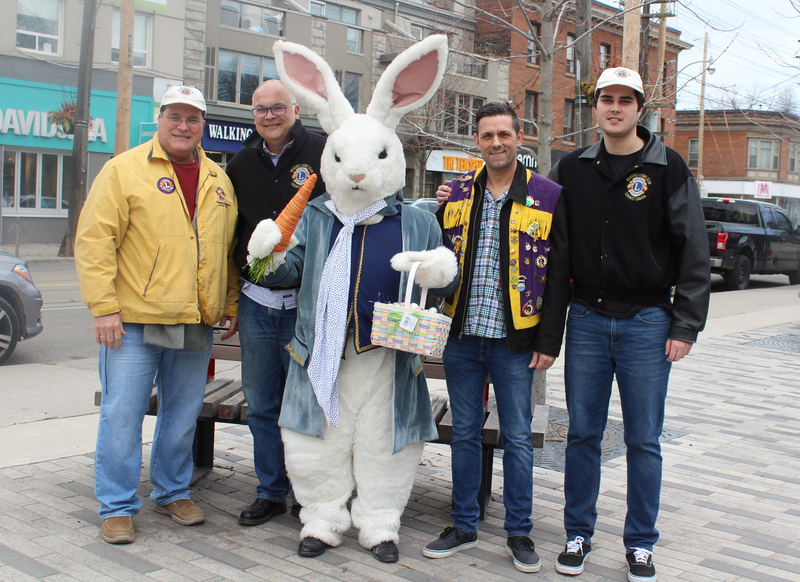 Getting ready for this Sunday’s Toronto Beaches Lions Club Easter Parade are (from left) club members Andy Buhot, Nick Trainos, the Easter Bunny, Ross Bordieri and Kiefer Buhot. The parade starts at 2 p.m. on Easter Sunday, April 21, at Queen Street East and Munro Park Avenue. The parade then heads westbound along Queen Street to Woodbine Avenue. Photo by Alan Shackleton. The Beach is getting ready to celebrate Easter in a big way, with the annual parade and an egg hunt all set for the next few days. This year’s Toronto Beaches Lions Club Easter Parade will feature 80 groups participating in what is considered the traditional start of spring not just in the Beach but all across Toronto. Ross Bordieri, president of the club, said the Easter Sunday parade, which takes place on April 21 starting at 2 p.m., brings out huge crowds of onlookers. The parade route runs along Queen Street East, starting at Munro Park Avenue in the east and making its way westbound to Woodbine Avenue. It will take approximately two hours for it to pass any one point. It is the largest Easter Parade in North America. Bodieri has a long association with the parade, having grown up in the Beach, and he said the Easter Bunny is always a highlight for the crowds of children watching. “We see the delight of the kids when they see the Easter Bunny, and it’s a great thing to see,” he said. As well as being president of the Toronto Beaches Lions Club, Bodieri also has a long personal connection to the club as his father Joe has been a member since 1977. Those attending need to know that Queen Street East will be closed between Munro Park and Woodbine avenues starting at 1:30 p.m. through to 4:30 p.m. People are advised to arrive early as big crowds come out to watch, and prime viewing positions along Queen Street East fill up quickly. Groups participating in this year’s parade will include, as always, the Malvern Collegiate Marching Band and Beach Metro News. This year Beach Metro News will be adding some music to its float courtesy of local “eclectic and electric” band The Two Fours. Started as a Centennial project in 1967, the Beaches Easter Parade was originally routed along the Boardwalk for its first seven years. The Beaches Lions Club became actively involved in 1973, and the next year the parade moved to Queen Street East. By 1981, the Lions had become the parade’s official organizer. Also on the Easter agenda is the second annual Good Friday Easter Egg Hunt set for Kew Gardens on Friday, April 19 from 11 a.m. to 2 p.m. The egg hunt will feature children’s entertainment and of course a visit by the Easter Bunny. There will be three dedicated hunt zones organized by the age of the participants. There will be Easter Egg hunt zones for children age two and under; for children ages three to six; and for children ages seven and above. Participants are reminded to bring their own basket.